If you are planning a Colorado wedding and looking for a unique urban location you need to check out Larimer Social. Located in Denver’s historic Larimer Square, this new event space is perfect for a city wedding. Larimer Social has over 6,800 square feet of flexible space, an intimate terrace and boasts amazing views of Larimer Square. I was lucky enough to sit down with Larimer Social and ask them a couple questions about this new space! When I visited this space, I knew that I would be counting down the days until I could plan a wedding at this Denver venue! 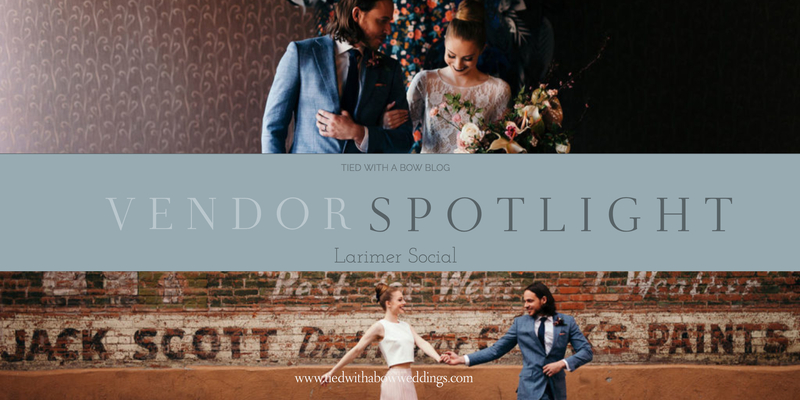 Keep reading to learn more about Larimer Social and consider them for your Denver wedding venue! How many people does your venue hold for an event? Our max capacity is 480 guests, however, 200 is what we suggest for seated dinners. Our location! We overlook historic Larimer Square, which gives guests the perfect backdrop for their dream event. What is your ideal couple? We don’t have an ideal couple per se, we enjoy working with anyone who is fun and has a creative vision. What is your planning advice for engaged couples? It is never too early to start planning- getting ahead will relieve a lot of stress from the process. Also, stay true to who you are as a couple! So many clients have an idea of what they “should be doing.” There is no right or wrong answer in planning your wedding. Everyone has their own tastes so stick to that and have fun- this should be an exciting time! What is your favorite photo spot for couples at your venue? The windows overlooking Larimer Square! If you find a perfect venue and want to know what questions to ask, check out this blog post! Looking to avoid the stress of finding your Colorado wedding venue? Let me help! With our Venue Selection service, you can consider us your personal venue real estate agent! Whether you are looking for classic estate, unique lofts, or dreamy hotels, we seamlessly marry your vision with the perfect backdrop. We will conduct detailed site inspections and once you choose your perfect location, manage venue acquisitions and contract negotiations while you plan the remaining details of your day. Check out this, as well as my other a la carte services here! Or, send me a note and we can get your planning started! Tied With a Bow Weddings is a boutique Colorado wedding planner creating beautiful luxury weddings throughout the Greater Denver Area and Rocky Mountains. Looking to plan your Colorado wedding? Learn more about me here, or contact me for your complimentary consultation! Need a little more pretty in your life? Sign up for the Tied With a Bow newsletter to get monthly inspiration, wedding planning tips, vendor highlights and more!